Martha Crone begins her 22nd year as Garden Curator. Flame Azalea (Rhododendron calendulaceum). Photo ©R A Howard, USDA-NRCS Plants Database. Galax (Galax aphylla) photographed in the Garden on June 28, 1956 by Martha Crone. Click on image for larger version. Another interesting introduction is Rhodora (Rhodora canadense), a small shrub with attractive pink flowers growing in moist places. A few others are Yellow Trillium (Trillium luteum) native in the Smokies, Rose Trillium (Trillium stylosum) Painted Trillium (Trillium undulatum) from the south, Western Trillium (Trillium ovatum) from the west and (Galax aphylla) from the south. The Friends held their second annual meeting on Tuesday Jan. 5, 1954 at the offices of the Burma Vita Company at 2318 Chestnut Ave. West, in Minneapolis. Elected to the Board of Directors were: Russell H. Bennett, Earle Brown, Dorothy Binder, Elizabeth Carpenter (new), Martha Crone, Donald C. Dayton, Clinton Odell, Leonard F. Ramberg, Carl Rawson (new), Mrs. Clarence (Edda) Tolg. Friends officers elected at the board meeting were Clinton Odell, President; Donald C. Dayton, Vice President; Mrs. Carroll (Dorothy) Binder, Vice President; Martha Crone Secretary/Treasurer. After just 1-1/2 years of organization, Martha Crone takes over the treasurer duties from Leonard Ramberg; she was also in charge of membership and was editor of The Fringed Gentian™. Membership at the time was 176. February 1954 was the warmest February since 1878. 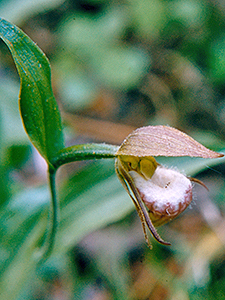 Ramshead lady's-slipper (Cypripedium arietinum) photographed in the Garden on June 9, 1954 by Martha Crone. Martha planted these in 1936, '37, '50, '51, and 1953. Click on image for larger version. Disporum lanuginosum, [Prosartes lanuginosa] Yellow Fairybells, not native, same source. Liriodendron tulipifera, Tulip tree, not native, same source. Passiflora incarnata, Purple Passionflower, not native, same source. Taxodium distichum, Bald Cypress, not native, same source. 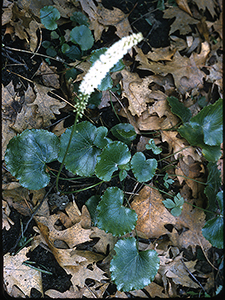 The path in the marsh showing many Foam Flower (Tiarella cordifolia) in bloom; photographed on June 3, 1954 by Martha Crone. Click on image for a larger version. This commentary on the misleading name reminds us that Eloise Butler had reason to change the Garden’s name early in her tenure. She wrote in her early history “It was soon found that the term ‘Wild Botanic Garden’ was misleading to the popular fancy, so the name was changed to ‘Native Plant Reserve’.” Even more interesting here is that Martha Crone frequently referred to the Garden in her notes and reports as the “Reserve” not the ‘wild flower garden’. Aconitum uncinatum, Southern Blue Monkshood, not native, from Hinds, 1214 W. Broadway who got it from the North Shore. 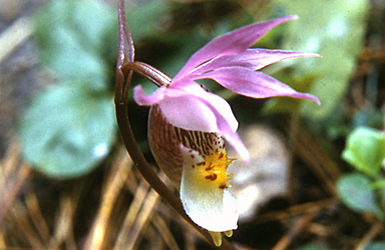 Fairy Slipper Orchid (Calypso bulbosa), photographed in the Garden on June 1, 1954 by Martha Crone. She planted this species in 1954 and in many previous years back to 1935. Eloise Butler had also planted it in a number of years beginning in 1913. Click on image for larger version. Aster pringlei [Symphyotrichum pilosum, var. pringlei] Pringle’s Aster, Awl Aster, native, no source given. Polemonium caeruleum, Charity, not native, no source given. It was not mentioned in her log, in the Friends Newsletter, or in her annual report, but full time help arrived in the Garden this Spring, when the Park Board hired Ken Avery to be her assistant. 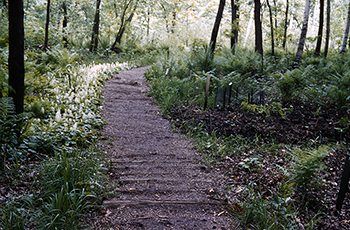 Photo top of page: A path into the wetland, photographed by Martha Crone on June 3, 1954. Martha Crone's Annual Report to the Board of Park Commissioners dated Feb. 21, 1955 to Superintendent Charles E. Doell. Vol. 2, # 1, January 1954, Martha Crone, Editor. Vol. 2, # 2, April 1954, Martha Crone, Editor. Vol. 2, # 3, July 1954, Martha Crone, Editor. Vol. 2, # 4, October 1954, Martha Crone, Editor.